What could be more pleasing to travellers in the northern province of Yên Bái after conquering Tà Chì Nhù Mountain? Soaking in hot mineral springs with a picturesque landscape laid out in front of them. Located around 2km from Trạm Tấu District, the springs in Hát Lừu Commune lie under a small valley, surrounded by terraced fields and hills of pine forests that sway with the gentle breeze. 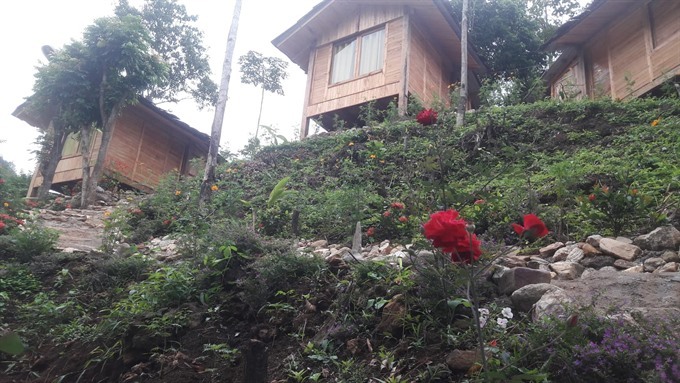 Travellers can also choose to stay overnight at a homestay next to the spring to enjoy a night in the mountains. According to Vũ Mạnh Cường, the owner of a homestay, the springs cover 600sq.m with temperatures ranging from 35 to 38 degrees Celsius. Its water is so transparent that the bathers can even see the pebbles sparkling at the bottom. Even on winter days, they do not feel the cold while soaking themselves in the springs, he said. The best moment to enjoy the hot baths is in the springs with the steam rising above the water, mingling with the early mist to create a fairytale scene. 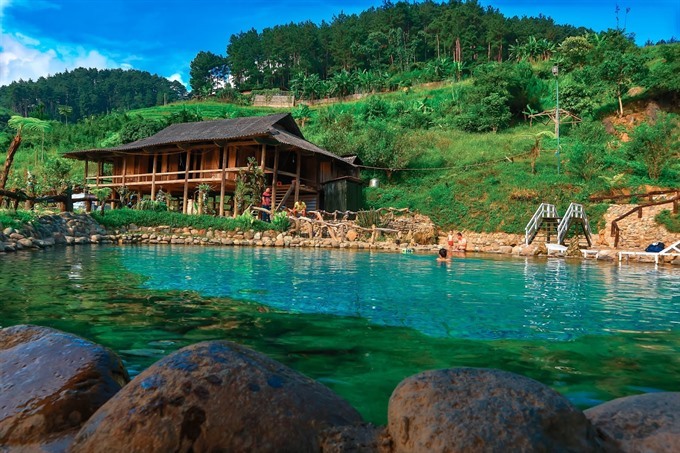 According to locals, the hot springs are naturally fed from the earth. It used to be a local secret, but over the past year, Cường has constructed his homestay and attracted more tourists to the area. Cường said the homestay had two outdoor baths, 10 double rooms and one communal room, all of which can accommodate nearly 80 guests. It costs from VNĐ300,000-700,000 (US$13-30) for a night in a double-room and VNĐ100,000 ($4) in the communal room with free bathing in the hot mineral springs. “The locals swim in the hot springs for free. Tourists who are not guests only have to pay VNĐ10,000 (40 US cent) for children and VNĐ20,000 (80 US cent) for adults,” Cường added. His homestay also serves trustworthy local food of the Mông and Thái ethnic groups like grilled meat, grilled fish, five-coloured sticky rice, dried meat and grilled bamboo shoots. At weekends, guests can enjoy art performances by local ethic people such as Khèn dancing and try making local specialties like dày cake. To many backpackers like Nguyễn Tuấn Vũ from the northern province of Tuyên Quang, a visit to the hot springs and homestay is a memorable experience. “I learned about the springs by chance: I visited my university friend nearby and was led there,” Vũ said. 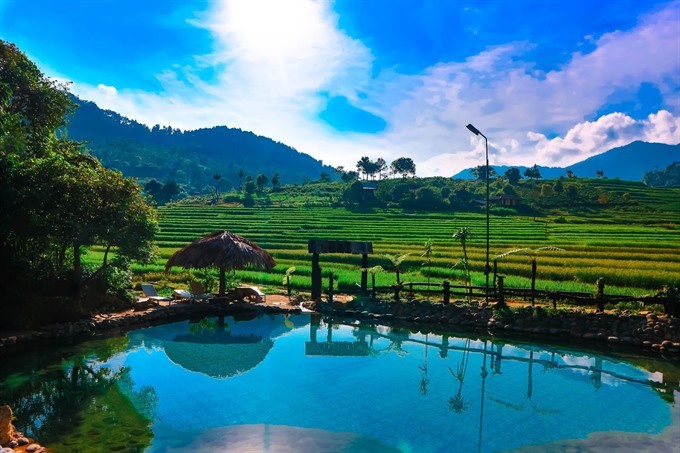 “I was really overwhelmed by the stunning picture stretching out in front of my eyes: the hot springs lay just below the foot of a hill, overlooking a wide space of interminable ripen terraced fields. 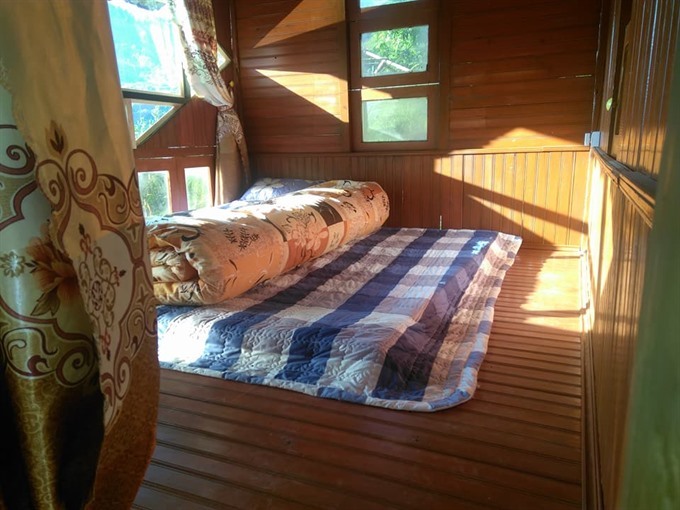 “Everything was nice and comfortable in the homestay,” he added. “Immersing myself in the warm water and enjoying the steam rising up against a stunning natural background helped me to relax and recharge,” said Nguyễn Xuân Huyền, another visitor from Hà Nội. 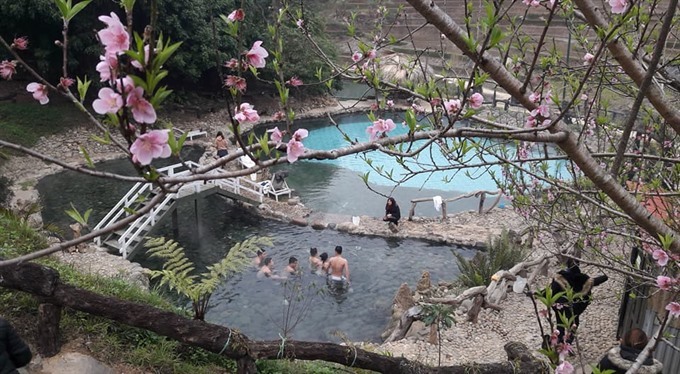 Cường said that in the years to come, he plans to expand his accommodation and renovate the transport system to offer convenient travel for tourists who wish to visit and bathe in Trạm Tấu’s hot springs. He also plans to grow fruit trees to offer community-based tourism in the area. “Tourists will be able to plant vegetables and pick fruits to take home. 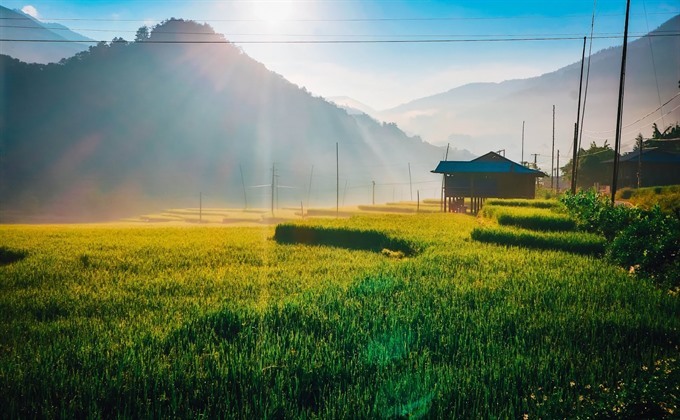 I hope that more people will discover Trạm Tấu, which is one of the poorest districts in the country, but also a land full of tourism potential,” he added.